I definitely enjoyed the idea of sleeping away from the ground. I wouldn't have to worry about finding a non-root infested flat spot to comfortably sleep. Granted I always used an old RidgeRest and recently an inflatable ThermaRest (which is very comfortable and warm). I kept the ThermaRest with me on the first outing just in case I couldn't sleep in the hammock and had to resort to the ground. I invested in the Slap Straps from ENO as well that claim a quick attachment to a tree but have a lot of terrible reviews due to them being made of nylon and stretching throughout the night. I noted that most of the people complaining of this issue were over 200lbs so I went with it and yet to have an issue. I seem to be a good 60-70 lbs lighter than most hikers so it works for me. When I first got the hammock I was not impressed with the very heavy and bulky carabiners attached. I quick replaced those with some ultralight Black Diamond carabiners to shave a few ounces and it was well worth the trade I think. I quickly ran outside eager to try this thing out and I wanted to get a feel for setup before trying it on the trail. I found a good span between some trees and hung it according to the specs and found it quite comfortable. I went with the Double Nest not because I am big, need the extra room, or plan on sharing it with someone else. In fact I would love to see two people sleep in this thing! I got the DN for the extra fabric and so I could sleep at an angle horizontally and maybe, just maybe sleep on my side if I got flat enough. Well, the extra fabric was nice as I could wrap it around like a cocoon and deflect a cool breeze and it did give me that extra foot room but I have yet to successfully sleep on my side without a lot of squirming. I don't normally sleep on my back as a general rule, or rather I sleep on my side until I naturally end up on my back through the night. So I did sleep well on my back although the slight banana shape is a little weird at first to get used to. Supposedly it is a shape to be in while sleeping for therapeutic purposes though. I did find myself to be less stiff the next day and I probably got about the same amount of rest as I would lying on the ground anyway so, I think I got off to a good start. The next big advantage to using a hammock would be not having to worry about a flat spot. Last summer, on my first trip with the hammock, we ended up sleeping literally on the side of a mountain and all I had to do was find some trees. The rest of my equipment was sliding down but the hammock succeeded where I would've found myself at the bottom of my bag on the ground. So, on this front it is a very successful product and one that I will continue to use in the warmer season. Hammock-ing is definitely something to try out but I wouldn't ditch your tent or bivy until you're comfortable with it. I like having the option and I will still go for the bivy for colder weather hikes. 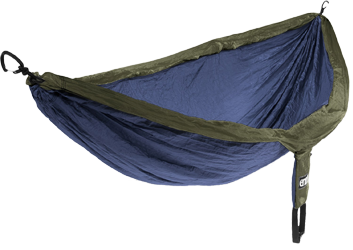 The ENO hammock is certainly a great buy compared to the other hammocks out there but apparently it's considered a bit lower-end comparatively. It is a lightweight solution, packs small, and is cheap. If nothing else it is great to bring along for a day hike to swing on the top of a mountain with some lunch or toss it up in the backyard. Either way it's well worth the 60-70 dollars if you enjoy being outside and I would definitely recommend giving it a shot.